It seems like the opening to a joke. An artist shuffles into a French establishment with his leashed cormorant. After a day of fishing, the diminutive man and his odd pet make their way to a nearby table to share a drink. But there’s no punch line. Turns out this is actually a true story. Not only did the famous late-nineteenth-century painter Henri Toulouse-Lautrec own several tamed cormorants; the birds were also his fishing buddies (1). And he occasionally led one of the creatures into a café with him. There the post-impressionist artist and “Tom” would indulge in absinthe (2). “It has developed a taste for the stuff,” Toulouse-Lautrec supposedly told a friend. “It takes after me.” (3) Not surprisingly, the avant-garde artist renowned today for his Moulin Rouge posters, passed away relatively early in life, suffering from alcoholism, syphilis, and mental illness. 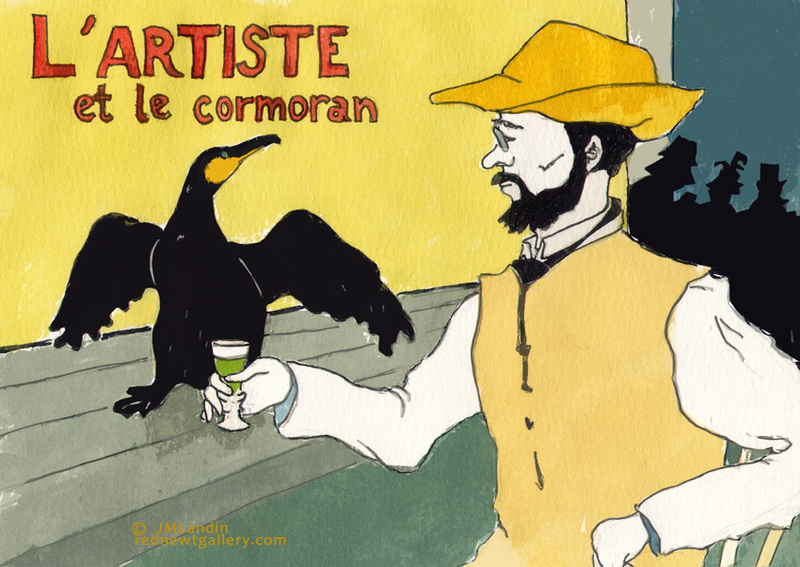 While many odd connections exist between the famous and the feathered, none of them top Toulouse-Lautrec’s absinthe-drinking cormorant. However, John Barrymore’s pet comes close. The American stage actor and grandfather of movie actress Drew Barrymore collected exotic animals. One of these included a hissing vulture named “Maloney” that habitually preened the thespian’s mustache (6). What stories that must have made for Hollywood gossip magazines! In all seriousness, let’s hope the bird, after feeding on a carcass, didn’t go anywhere near its owner’s mouth. Throughout their lives, both Barrymore and Toulouse-Lautrec had many pet birds. For creative types, such affinities were not that unusual. Quite a few larger-than-life historical personalities surrounded themselves with exotic animals. For instance, a menagerie belonging to the British Romantic poet Lord Byron included an eagle, a falcon, a crane, and some peacocks (7). Among Frida Kahlo’s feathered friends, the Mexican artist counted an eagle and numerous parrots, such as her beloved “Bonito” (8). Also, Pablo Picasso enjoyed the company of winged pets; he is said to have kept an owl, canaries, pigeons, and doves (9). Some writers willingly shared their limelight with pet birds. Charles Dickens’s talking raven “Grip” shaped several notable works of nineteenth-century literature. Fashioned into an avian character within the Victorian author’s novel Barnaby Rudge, the bird soon went on to inspire one of the most popular poems of all time—Edgar Allan Poe’s “The Raven.” However, rather than repeating “Nevermore,” Dickens’s corvid chatted, “Halloa old girl!” (10) Ages ago, the ancient Roman writers Catullus and Ovid wrote poems concerning the deaths of their lovers’ pet birds. In the case of the former, a sparrow, and the latter, a parrot (11, 12). Clearly, even back then people were forming impressive emotional bonds with their feathered friends. Death is an inevitable part of life, pet birds without exception. Some of Toulouse-Lautrec’s cormorants, like their artist-owner, came to unfortunate ends. One bird was shot, and another died from throat blockage caused by an eel (13). Although I’m not certain whether any elaborate rites were held for his deceased pets; such instances are not without precedent. According to Pliny the Elder’s Natural History (Book 10, Chapters 122-123), a large procession turned out for the funeral of a talking pet raven, a favorite of the Roman Emperor Tiberius (14, 15). Also, Wolfgang Amadeus Mozart lamented the passing of his pet starling with a poem and a small ceremonial gathering (16). Unlike Mozart’s starling, which could trill a portion of the maestro’s Concerto in G Major, U.S. President Andrew Jackson’s African grey parrot possessed a rather unpleasant talent. “Poll,” who outlived its master, loved to spout obscenities. The poor bird even disrupted Jackson’s funeral with several profane outbursts, forcing its eventual removal from the service (17). I guess you could say that attendants of Toulouse-Lautrec’s funeral, especially his pious mother, were fortunate in this regard. Cormorants can’t mimic human language. Nonetheless, thanks to his café escapades decades ago, “Tom” still gives us plenty to talk about today. Frey, J. Toulouse-Lautrec: A Life. New York: Penguin Books USA Inc. pp. 274, 344, 371. King, RJ. The Devil’s Cormorant: A Natural History. Durham, NH: University of New Hampshire Press, University Press of New England, 2013. pp. 12-13. Williams, P. “The Tallest Trophy,” 4/20/15. The New Yorker: http://www.newyorker.com/magazine/2015/04/20/the-tallest-trophy. Jenner, G, McFarnon, E. “Anne Boleyn’s lapdog and John Quincy Adams’s alligator: 10 famous people in history and their bizarre pets,” 2/13/2014. History Extra: http://www.historyextra.com/feature/anne-boleyn%E2%80%99s-lapdog-john-quincy-adams%E2%80%99s-alligator-famous-people-history-and-their-bizarre-pets. Boehrer, BT. Parrot Culture: Our 2500-Year-Long Fascination with the World’s Most Talkative Bird. Philadelphia, PA: University of Pennsylvania Press, 2004. pp. 135-137. Morris, D. Owl. London: Reakton Books Ltd., 2009. p. 128. Lane, RM. “Charles Dickens bicentennial, and his link to Poe,” 1/13/2012. The Washington Post: http://www.washingtonpost.com/lifestyle/style/charles-dickens-bicentennial-and-his-link-to-poe/2012/01/03/gIQA8VwdwP_story.html. Lazenby, FD. “Greek and Roman Household Pets,” The Classical Journal. Vol. 44, No. 4 (Jan. 1949). pp. 245‑252 & Vol. 44, No. 4 (Feb. 1949). pp. 299‑307. Online via University of Chicago: http://penelope.uchicago.edu/Thayer/E/Journals/CJ/44/4/Household_Pets*.html. Frey, J. pp. 480, 274. West, MJ., and King, AP., “Mozart’s Starling,” American Scientist, Vol. 78, No. 2 (Mar. 1990): pp. 106-14. Online via Indiana University: http://www.indiana.edu/~aviary/Research/Mozart%27s%20Starling.pdf.